Do you think the new fixed shot clock will increase or decrease the number of goals scored per game in the 2019 @NCAALAX season? 50 votes later, 3 out of 4 voters expected the shot clock to increase scoring. And it is easy to understand their logic: shorter possessions equals more possessions. More possessions means more chances to score. More chances gets you more goals. Of course that assumes that the quality of those chances does not deteriorate commensurately. If teams cannot work their way into a good shot within 80 seconds, then the extra possessions will not necessarily lead to more goals. That is the central question: does the 80 second cap constrain offenses enough to offset the rise in possessions? However, the effect is not going to be uniform on every team. Some offenses have made their hay by being aggressive and attacking quickly. A team that is well versed in scoring by exploiting a defense’s disorganization may not even have to change their approach to account for the new rules. The flip side is those teams who patiently probe a defense until a mistake creates an opportunity. The new rules may not allow them time to let their strategy marinate into a delicious goal filet. Who wins? Does anyone lose? 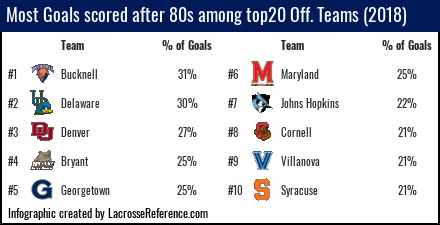 The graphic below came from an analysis of the top 20 most efficient offenses last year. I took a look at the percentage of their goals that were scored after 80 seconds of possession. In effect, of our top offenses, these were the ones that relied more on “patient” offense. I would argue that we will get a good sense of whether the new rules hurt offenses or defenses more by looking at these teams. If patient offenses are able to quickly retool and adopt a more aggressive approach without sacrificing efficiency, then look out scoring records. For what it’s worth, I agree with the majority view. In our work looking at efficiency by possession length, it seems that patience in a possession is more likely to cause a turnover than it is to result in a great chance. Hopkins a few years ago was a good case in point. In a world with no shot clock, patience on offense had the added benefit of letting a defense rest. That probably made slow versus fast offense a toss up. With that out the window, I would expect aggressive offense to show itself as the more efficient approach. Please do a recap mid way through the year and again at the end. Would be really great to see the numbers play out!